If you keep an active inventory on your site, you may want to let customers know when a previously out of stock item becomes available. To do this, you can use the product availability notifications feature. Now that you are in the ‘General’ tab of the catalog settings, scroll down until you see the ‘Product Status Settings’. If you do not already have your default stock statuses set, go ahead and do that now. 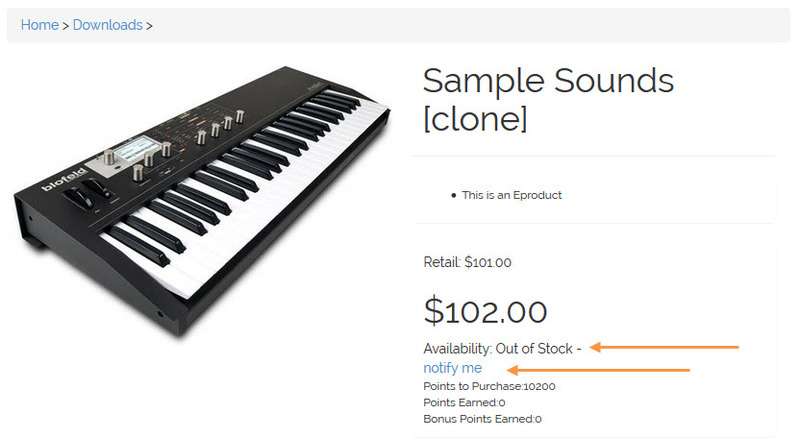 Next, scroll down to the section labeled ‘Product Notifications’. 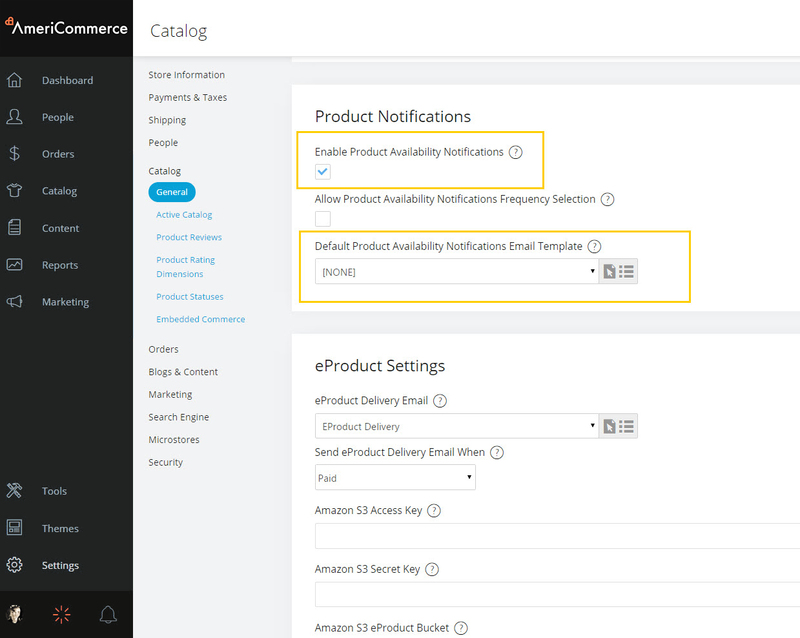 Click the checkbox labeled ‘Enable Product Availability Notifications ’ to turn notifications on. The second checkbox is optional; it is labeled ‘Allow Product Availability Notifications Frequency Selection’. When this option is enabled, the customer can opt to receive notifications once and then be removed from the notification list, or be notified every time the product becomes available (until they decide to unsubscribe). Next, set the ‘Default Product Availability Notifications Email Template’ to ‘Product in Stock Notification’ and click save in the top, right corner. Now that the settings are enabled, the merge codes need to be added to the product details page before the notification will display. To add the merge code, navigate to Themes > Edit. Once in the theme editor, you will need to click on ‘Pages’ to expand the menu down the page. Once the menu is expanded, scroll down and click on ‘Product Details’. Next, click on ‘HTML Editor’. You will now need to add the merge codes $$AVAILABILITY$$ and $$NOTIFYME$$ to your product details page. In this example, I chose to add them directly under the price. 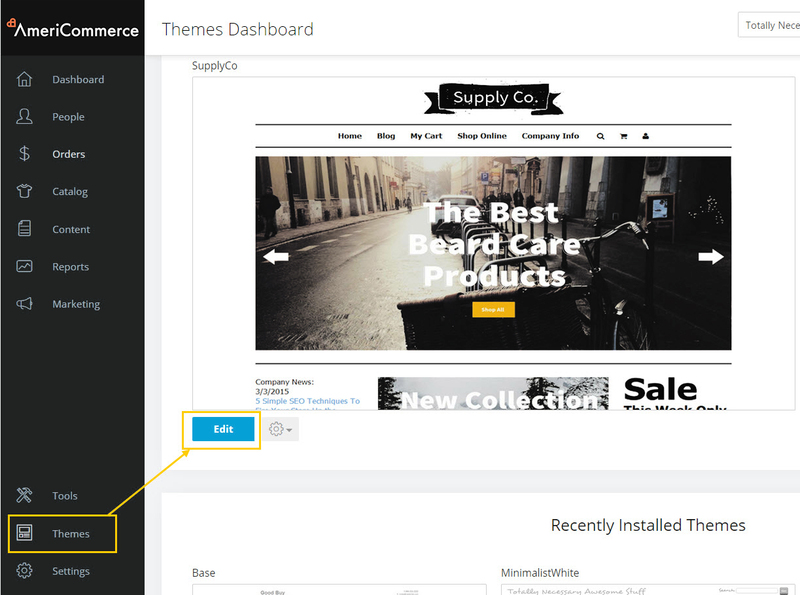 Here is an example of what it looks like on the storefront once the merge code has been added.